See in Glossary), click the small drop-down panel in the top right, and select Open Editor Log. See in Glossary files to store references and settings. 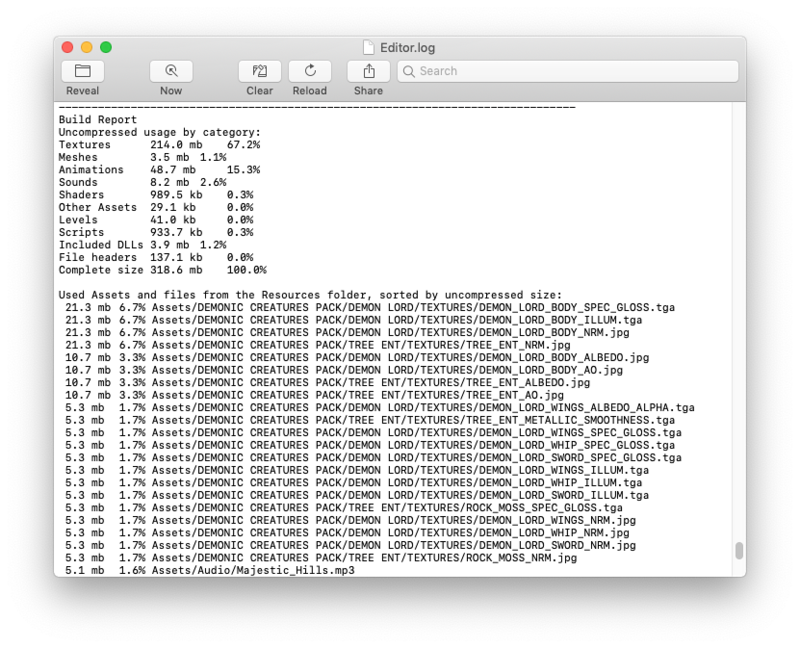 The headers normally make very little difference to Asset size, but the value might be large if you have numerous large Assets in the Resources folder. Unity re-codes imported Assets into its own internal formats, so the choice of source Asset type is not relevant. For example, if you have a multi-layer Photoshop Texture in the Project, it is flattened and compressed before building. Exporting the Texture as a .png file does not make any difference to build size, so you should stick to the format that is most convenient for you during development. Unity strips most unused Assets during the build, so you don’t gain anything by manually removing Assets from the Project. The only Assets that are not removed are scripts (which are generally very small anyway) and Assets in the Resources folder (because Unity can’t determine which of these are needed and which are not). With this in mind, you should make sure that the only Assets in the Resources folder are the ones you need for the game. You might be able to replace Assets in the Resources folder with AssetBundles - this means that Unity loads Assets dynamically, thereby reducing the player size. See in Glossary. See documentation on platform-specific Texture compression for more information. See in Glossary. Changing the maximum Texture size does not affect your Texture Asset, just its resolution in the game. By default, Unity compresses all Textures when importing. For faster workflow in the Editor, go to Unity < Preferences and untick the checkbox for Compress Assets on Import. All Textures are compressed in the build, regardless of this setting. See in Glossary, select the Mesh, then in the Inspector window set the Mesh Compression to Low, Medium or High. Mesh and Animation compression uses quantization, which means it takes less space, but the compression can introduce some inaccuracies. Experiment with what level of compression is acceptable for your models. See in Glossary for more information about this.